The theory posits that Lucas original plans were for Jar Jar to be the actual Sith Lord behind-the-scenes manipulating the events of “The Phantom Menace”. Believe it or not, much of this theory is reasonably solid. Scarily solid. And I’m actually down with a lot of it. But there’s a couple of problems that no one is addressing, and I think they should be pointed out. The theory actually makes a number of reasonable, sometimes accurate observations, but makes one important erroneous conclusion. A lot of this is pretty good, but I’d argue a few things. For instance, I’d argue Jar Jar isn’t making a Force Jump here. One could argue that Jar Jar was so adept at misdirection and clouding people’s minds that he performed remarkable Sith feats right in front of people who should have otherwise noticed. But I think a lot of Jar Jar physical feats were something common to his species, and why the Gungans were such fierce warriors. …always suggested to me that Jar Jar was more than he seemed. In the novelization of “The Phantom Menace”, after Jar Jar stumbled into defeating so many droids like this, the other Gungans are described as being awestruck and they, in turn, begin fighting the droids with even more vigor. Palpatine obviously wanted this battle lost by The Trade Federation and pretty much knew it in advanced. Holding the line while Anakin started down the path of becoming a Jedi was pretty much the point of this whole exercise. Jar Jar would have just had to keep the Gungans alive long enough to have their moment of victory when the droids all shut down. Also, that dead shot right into a Droideka’s one weak spot, his knee joints, was beyond luck. I can’t argue that much of what Jar Jar was capable of seemed to suggest he was more than just a bumbling oaf. Some of these don’t seem to be in line with the usual type of hand waving gestures Force Mind Control usually works. Usually you have to say what you want, then wave your hand accordingly. Most, if not all of Jar Jar’s hand waving gestures and verbal recommendations in are the exact opposite of everything that everyone eventually ends up doing in those scenes. On the other hand, maybe this is the Sith version of Jedi Mind Control. And that’s how it works. Like a Force version of reverse psychology. Well, obviously not. But the more credible supposition, and the final conclusion of all the evidence put together, is that Jar Jar was originally intended to be the Sith Lord manipulating everything behind-the-scenes. Possibly even Darth Plagueis himself. That’s where the theory goes off the rails and forgets itself. One of the crucial aspects of the theory posits that the reason Dooku felt so shoehorned into Episodes II and III is because he was a last minute replacement “Darth Jar Jar”. That doesn’t work if Jar Jar is the Sith Lord behind it all. That would mean that the Sith Lord behind everything was revealed early on and before anyone learns about Palpatine? His apprentice? No, what actually makes more sense is that Jar Jar was Palpatine’s apprentice. This is why replacing his character with Dooku makes sense. Early on we would have had the big reveal that Jar Jar was a wolf in their midst, and is then responsible for dismembering Anakin. A childhood friend betrays him and almost kills him. This would better explain the emotional turmoil about killing Dooku in Episode III. 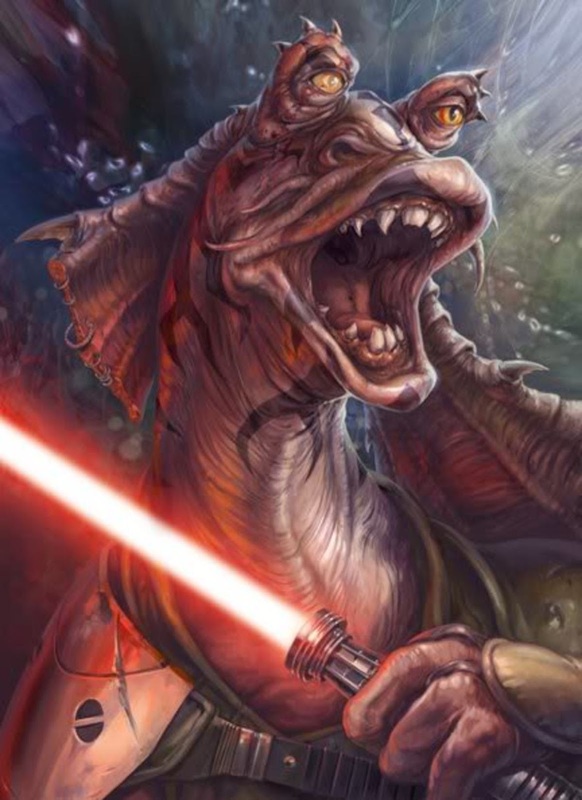 Killing Jar Jar, someone who he grew up and played with as a kid, would be a terrible burden on Akakin and would make more sense as early step on his path towards the Dark Side. It’s entirely possible that Dooku and Jar Jar were interchanged, and Dooku was supposed to be the senator that moved to give Palpatine his special senate powers. Even with Ahmed Best’s ambiguous confirmation, it’s just as likely none of this is true. But either way, if George really did back out from using Jar Jar for the majority of his story due to fan backlash or not, from a storytelling perspective and Monday Morning Quarterbacking, it’s a missed opportunity. Let’s just ignore fan reaction for a moment. (Not all of us hate the guy.) What a great way to put an “Empire Strikes Back” sort of reveal in Episode II. The fans were looking for it, even though I kept telling them not to. That George doesn’t really write that way, and that Empire just sort of happened to be shocking to our 7-year-old little minds. But looking back on the Prequels, I sort of see that kind of storyline as saving them, not from Jar Jar-hate, but from the ultimately poor way Anakin Skywalker was received. And I think young Hayden Christensen’s acting is what damaged the Prequels more than anything else. Far more than Jar Jar, if he had any real effect at all. Despite the meme, “The Phantom Menace” actually has better pacing and a more solid story structure than the final two. And a sudden and unwarranted rewrite would totally explain that. There was clearly something missing with Episodes II and III, especially considering how much of a part Jar Jar played in the early chapters. I always felt that deficit, and I blamed the fans and, later, the internet for it. I would have liked to have seen how Jar Jar was originally going to play out, even if he wasn’t a secret Sith Lord. But geez, that would have been totally cool. And the internet still would have totally hated it.